Resuming Barcelona as a topic, here I leave you with a view of carrer Petritxol at Barri Gotic. Some people come and some other go for time immemorial. 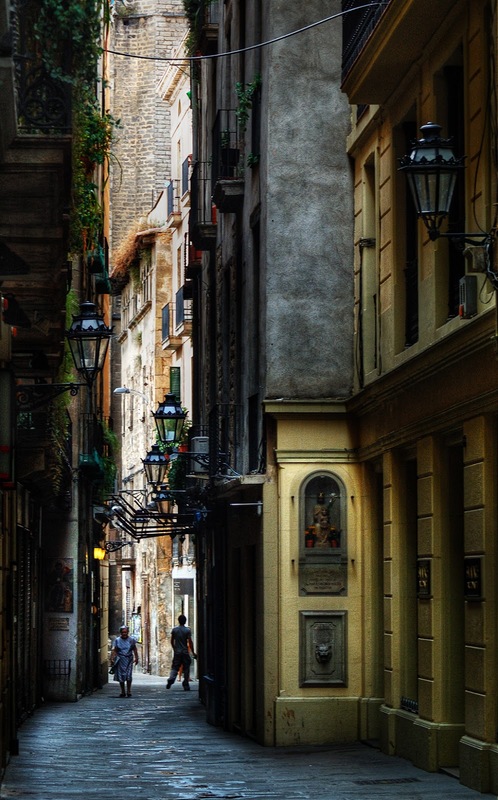 Streets remain but they will also disappear some day and Barcelona will not be the same. History is caged in this part of town and without it we will be dehydrated, decaffeinated or whatever "de" something you may think of. So let's protect our history and restore the Gothic quarter! By the way, remember it is traditional to have churros at carrer Petritxol! what an ideal photograph! this speaks of Barcelona to me - the jumble of architecture of the centuries is something lacking in U.S. cities. are there any areas of medieval architecture surviving in Barcelona? is there any evidence of Roman occupation? looks like a medioeval district of Lucca. i like the wet tiles on the ground, those street lamps, and the light at the end of the street. I like the framing here .. Very nice!! I am from Rome, take pictures too, and I will be living right in Carrer Petritxol for one and a half month next autumn!! Hope to shoot pictures as good as yours! Ciao!